A bit like decent gins, there’s a growing trend towards good quality, small batch, artisan ice creams and sorbets. And although we’ll always have a soft spot for Mr Whippy, we’re actually loving the focus on decent ingredients and food made with love. 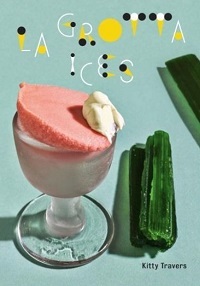 In a small converted greengrocers in south London, Kitty Travers has patiently created an array of iced delights, and now her recipes are available to everyone by way of this rather lovely book. This is a light and not-too-sweet ice cream, with a delicious old fashioned flavour. It’s Kitty’s signature vanilla and is popular all year as it’s refreshing in summer, yet also excellent served alongside more wintery puddings – Christmas pudding in particular. 1. To prepare the ice cream: split the vanilla pod using the tip of a sharp knife, scrape out its seeds then add both seeds and pod to a nonreactive pan, along with the milk and sea salt (and cream if making the richer version). Stir often using a whisk or silicone spatula to prevent it catching. Once the liquid is hot and steaming, whisk the egg yolks and both sugars together in a separate bowl until combined. 2. Pour the hot milk over the yolks in a thin stream, whisking continuously. Return all the mix to the pan and cook over a low heat until it reaches 82°C, stirring all the time to avoid curdling the eggs and keeping a close eye on it so as not to let it boil. As soon as your digital thermometer says 82°C, place the pan into a sink of iced water. 3. Add the crème fraîche and rum and whisk into the custard. Speed up the cooling process by stirring the mix every so often. Once the custard is at room temperature, scrape it into a clean container, cover with cling film and chill in the fridge. 4. To make the ice cream: the following day, use a small ladle to push the custard through a fine-mesh sieve or chinois into a clean container. Reserve the vanilla pod (see Ingredients, page 19) then liquidise the cold custard with a stick blender for a minute. 5. Pour the custard into an ice cream machine and churn according to the machine’s instructions until frozen and the texture of stiff whipped cream, about 20 – 25 minutes. 6. Scrape the ice cream into a suitable lidded container. Top with a piece of waxed paper to limit exposure to air, cover and freeze until ready to serve.